Released in the fall of 2015, our 2012 vintage also achieved Gold Medal status - 90 points - an exceptional rating. A dark ruby color in the glass seduces with aromas of crushed cherries, ripe plums, and cherry pie. 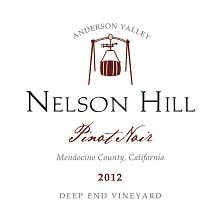 Medium body, dry-yet-fruity, this pinot delivers flavors of black cherry, cola, black raspberry, and spiced apple. This delicately spiced wine finishes with a soft, velvety mouth feel.